New Dealer/Contractor to this site? Register for a password. Manual or Programmable Operation: Change operation from manual to programmable by pressing the ON/OFF button. When “Program is Off” is heard it operates as a conventional thermostat and temperature setting adjusts by pressing the UP and DOWN keys. 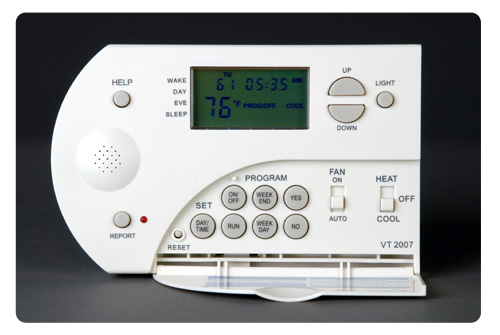 When “Program is ON” is heard it operates as a programmable thermostat and temperature settings automatically adjust four times a day. Off the Wall Programming: Front plate of thermostat can be detached for program set up away from the wall mounted base.